Looking for mortgage options or looking for a lender with no lender overlays? Some lenders have tougher guidelines than other due to having an internal guideline on top of agency guidelines. Work with a lender with no overlays because often time/money can already be invested and the result is a last minute denial in underwriting. What some lenders do is add their own requirements to already established rules making it more difficult getting approved for a loan. Just because a borrower does not qualify with one lender, does not mean they will not qualify for another – loan denials are not uncommon. It is important to be upfront with your Loan Originator so that they can structure the loan properly to save time and prevent confusion during the underwriting process. It is common to apply to a lender and they have an internal guideline on top of established guidelines. There are Non-QM mortgages that take a more common sense approach to underwriting. One example would be the fresh start, which allows a day out of foreclosure and day out of bankruptcy. The minimum standards for an FHA loan depends on the bank, lender, or broker, which they can add their own requirements for approving an FHA loan. Guidelines can often be confusing to real estate and mortgage professionals. The U.S. Department of Housing and Urban Development (HUD) set standards for FHA mortgages and is published in the FHA Handbook 4000.1. The best way to know if you qualify is to go through the pre-approval process and talk to an experienced Loan Originator that is familiar with your case scenario and FHA guidelines. Are refer/eligible, which means that the loan is eligible for a manual underwrite. Downgraded to a manual underwrite because of stipulations. Some lenders require a minimum credit score. Requiring a minimum credit score is common for lenders – some examples include requiring a minimum of 640, 620, and 600. 10% for a FICO Credit score under 580. The U.S. Department of Veterans Affairs provides a home loan guaranty benefit for housing-related programs setting minimum standard guidelines in the Lenders Handbook – VA Pamphlet 26-7. Not allowing a manual underwrite. With refer/eligible automated underwriting findings, a borrower can qualify for a VA loan if all criteria is met. Some lenders require a minimum credit score of 600, 620, or 640, but the VA does not mandate a minimum credit score. Fannie Mae and Freddie Mac have selling and servicing requirements that are published with minimum standards. Fannie Mae Single Family Selling Guide and Freddie Mac’s Seller/Servicer Guide are published online. During the pre-approval process, the Automated Underwriting System (AUS) is run that makes understanding guidelines easier. Debt-to-income ratios being too high. When personal debt-to-income is too high for investment properties, there are programs available that qualify based on cash flow coverage of the property. This is common for self employed borrowers. Requiring a higher credit score than set standards. Requiring a minimum down payment. For first time home buyers, the home possible and home ready program requires as little as 3% down payment with 4% and 5% grants available. Requiring a borrower to have a bankruptcy discharged for 2 years. A chapter 7 bankruptcy just has to be discharged. Can refinance in a chapter 13 with the trustee’s approval. With limited documentation, some lender will deny a mortgage supplement verifying late payments that have bankruptcy on the mortgage supplement. In most cases, this does not mean that the bankruptcy is in the payment, but the borrower continued to make payments during the bankruptcy and kept the mortgage outside. A utility bill showing that there is a previous balance still due. Non-credit qualifying streamline refinances do not require a minimum credit score. A Non-QM loan is considered a portfolio loan meeting parameters outside FHA, VA, USDA, and conventional standards. These types of loans take a more common sense approach to the ability to repay and are subject to a case by case scenario. Not having a valid work VISA or social security number. The ITIN program allows temporary work agencies, no social security number or work VISA. Seasoning on bankruptcy, foreclosure, deed-in-lieu of foreclosure and short sale. We have fresh start loan program that do not require seasoning after a bankruptcy, foreclosure, deed-in-lieu of foreclosure or short sale. The 1st example would be an overlay on non-cash out refinance transaction. Some lenders have overlays because a property has been listed for sale within 90 days of the new mortgage. Truth is, a property must not be currently listed for sale and taken off the market before the disbursement date of the new loan when the transaction is a limited cash-out refinance. Another example would be an overlay on cash-out refinances transactions. Some lenders will say that a loan is ineligible if the property has been listed within six months of the disbursement date of the new mortgage. Fannie Mae’s selling guide states that a property must be taken off the market for the listing date of the new mortgage. 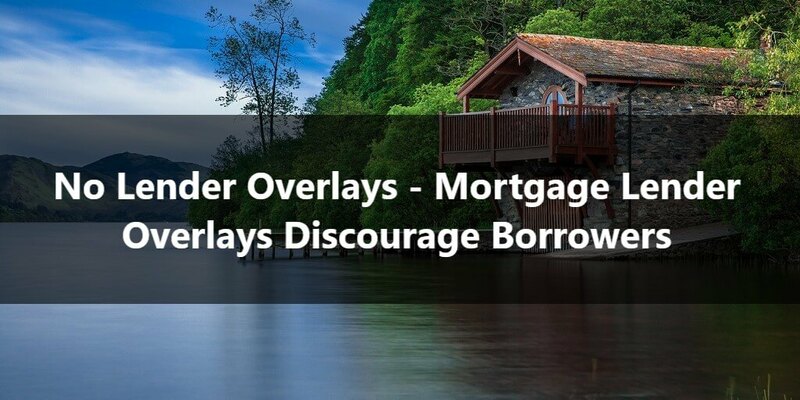 Overlays are created to manage risk, reduce overhead, and a lender could add a specific rule because they may not have the resources to underwrite the loan. Often lenders sell specific types of loans on the secondary market and other types of loans are not in their niche. Just because a lender allows manual underwrites with borrowers less than 600 credit score does not mean their pricing will always be competitive. Some lenders will say they do not have overlays, but have bigger hits on pricing with lower credit scores – meaning they are not competitive with the interest rate. Some lenders have smaller hits on pricing for borrowers with lower credit scores.